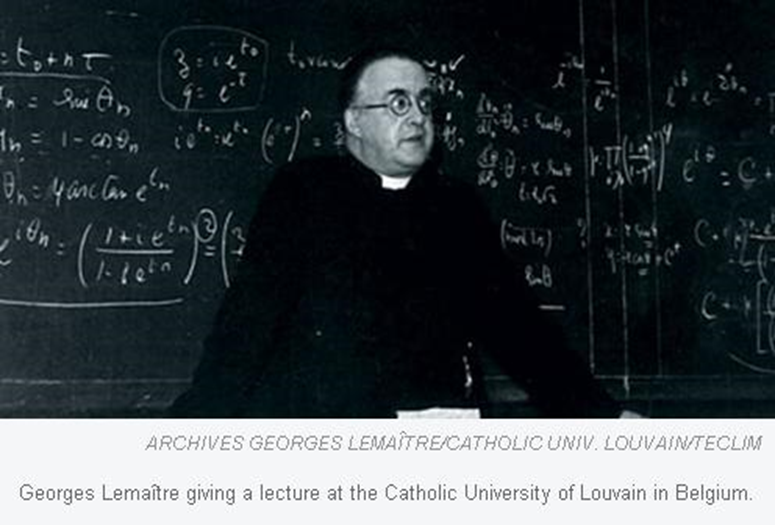 In 1927 Roman Catholic priest Georges Lemaître1 developed his theory of the expanding Universe and published a paper describing his theory,2 which envisioned a universe with all galaxies moving away from all other galaxies. At that time the Universe was considered to be static. Lemaître solved the gravitational field equations of Einstein’s General Relativity theory for the Universe, taking into account the work of Alexander Friedmann, who published in 1922 (but died in 1925). From that he concluded the Universe must be expanding or contracting. Nowadays that formalism for the family of models they produced is called the Friedmann-Lemaître solution describing the big bang universe. From that Lemaître developed the idea of the Universe having a unique origin at some past moment of time. You might think that Lemaitre looked to the Scriptures, to Genesis, for a clue here (for an origin in time) but his reasoning was man’s not God’s. His assumption was a finite unbounded universe, having no centre nor edge–that is, there are no preferred points in his universe. And by winding time backward one could imagine that all points would come to a common point at a finite period of time in the past. Thus he reasoned that this must mean that the Universe had a beginning in time—hence a creation at a moment in the past. Apparently Sir Arthur Eddington, a Quaker, found Lemaître’s idea of creation philosophically repugnant, as there was a prior belief among cosmologists at the time of the Universe eternally existing. From his quantum of energy—which he called a “primeval atom”4—his theory predicted that this was the material from which all matter—the stars and galaxies—was derived. He predicted that some form of background radiation, even cosmic rays, would be found, the leftovers of that initial explosion of matter into all the Universe.5 That is not accepted by big bang astronomers today. Eventually from his theory the origin of the Universe was formalised not from a ‘Cosmic Egg’ but from a singularity of zero dimensions with the Universe smoothly expanding out of it, and beginning in an intensely hot fireball stage. It wasn’t until 1949 that this was, in derision, called a ‘big bang’ on a BBC radio program by Sir Fred Hoyle, while discussing what his opponents believed. Hoyle was very much against any idea of a big bang universe, as he firmly believed in the steady state model. Figure 2: Distance versus radial velocity of expansion plots. Left: Lemaitre (1927), right: Hubble (1929). From Ref. 6. Unfortunately for Lemaître he published his 1927 paper in the French language, so when it came time to publish an English translation it was meticulously censored and all discussions of the radial expansion velocities and the distances to observed galaxies were deleted.6 He had published the very first empirical determination of the now very famous parameter the Hubble constant “H”, an important number in the big bang theory, but it was omitted in the later English translation. Quite obviously the Hubble law and the Hubble “H” constant were subsequently named after Edwin Hubble, who did not publish his paper until 1929, a full two years after Lemaître. From Hubble’s correspondence it is very clear that he knew of Lemaître’s work. So it would not be too much of a stretch to say that Hubble did not really discover an expanding universe at all. It would be historically accurate to say though that Hubble and his associate Milton Humason are responsible for the meticulous observations made to determine the brightness and redshifts of individual galaxies that resulted in their rigorous testing of the linear velocity-distance relation, now called the Hubble law. But it would not be true to say that Hubble was in any way responsible for its formulation. That can be seen in Lemaître’s complete original equation (24) in his 1927 French paper but not in its 1931 English translation. In 1929, after much backroom dealing, Hubble published his findings. As a result he was given the credit for the ‘discovery’ of an expanding universe. Hubble was given all the acclaim; Humason was not even mentioned. Nor was Vesto Slipher, who as early as 1912 made many redshift measurements of nearby galaxies. Hubble was even considered for the Nobel Prize but that couldn’t happen as it was against the rules then since Alfred Nobel didn’t like astronomers. By the time the rules were changed Hubble had died and a Nobel Prize cannot be awarded posthumously. Lemaître was educated at a secondary school, the Collège du Sacré-Coeur in Charleroi, run by the Society of Jesus, more commonly known as the Jesuits. The Jesuits are a secretive order of the Roman Catholic Church, formed to combat the Reformation, to undo the damage the Roman Catholic Church perceived that the Reformation did to them. As such the secretive order would use knowledge and learning to combat the Reformers. One of the effects that flowed from the Reformers was that believers started to take the biblical text at face value. If God said He created in 6 days about 4000 years before Christ they believed it. The Church of Rome lost many followers and much territory because of this shift. The Church of Rome also had absorbed much paganism between the 4th and 14th centuries. Added to that the Jesuits adopted a gnostic approach where human reason was coupled with mysticism. In fact, human reasoning was used to reinterpret the Holy Scriptures. So with that sort of education it is no surprise that Lemaître reasoned from a particular materialistic perspective. This is not the same as an atheist but more like the “cosmic humanist” who views the Universe itself as Creator. Lemaître was the product of his training and the Roman Catholic scholars employed this “cosmic humanist” type of reasoning. Lemaître may have argued that there was no connection with the biblical account in Genesis, as a sort of defense among his atheistic colleagues, that he was not being religiously motivated.7 This was brought to a head, however, when Pope Pius XII declared, at the November 22, 1951, opening meeting of the Pontifical Academy of Sciences, that the big bang theory does not conflict with the Roman Catholic concept of creation. Except for the origin at a finite time in the past one would be hard pressed to find any correspondence between the big bang cosmogony and the biblical account of creation. Therefore the Catholic concept of creation must be so mythologicalised that it finds no conflict with the alleged big bang history. Lemaître apparently was not too happy about the pope’s announcement, but there can be no doubt that he was religiously motivated, though not from a straightforward reading of the Genesis account. Lemaître’s cosmogony had the whole Universe bursting out of a ‘Cosmic Egg’. He described it as “the Cosmic Egg exploding at the moment of the creation”.5 He called this his hypothesis of ‘the primeval atom’ where all the material of this Universe burst out of that ‘primeval atom’ forming the matter in the stars and planets, everything in the Universe. Figure 3: Lemaitre took Einstein’s finite unbounded static universe and had it expanding as a function of time (time runs left to right). This artist conception is of an orb growing in size where the galaxies are represented on the surface of the expanding orb. This is the balloon analogy often used to explain the expansion of the big bang universe where the 2D surface of the balloon represents 3D physical space. Separate out the so-called scientific elements (the balloon analogy, see Fig. 3) and what remains in his model of the origin of the Universe from a ‘Cosmic Egg’ is the ‘hatching out’ or ‘birth’ of not only an expanding universe but also all that it contains—all the material from which the stars formed. Lemaître’s ‘Cosmic Egg’ was later called the singularity and that has its own problems.8 But the concept of the origin from an egg is a pagan concept. The concept of the Cosmic Egg is connected with rabbits and the origin of Easter. Here I quote how a pagan understands this. One historian put it this way. The concept of birth in the heavens from an egg is very much pagan and many symbols can be found describing this. The egg in Fig. 4 is also called Tyron’s egg and also the Masonic Egg. There is much pagan mysticism around these motifs. 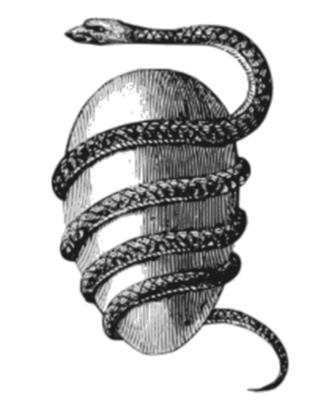 Interestingly the serpent, which symbolizes evil in the biblical creation account, is shown wrapped around the Cosmic Egg. Evolution fits in very well with pagan beliefs that everything evolves from the simplest to the complex. 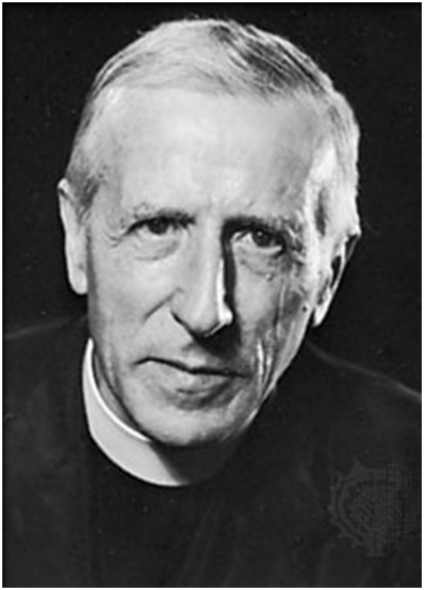 A Roman Catholic Jesuit priest to note here is Pierre Teilhard de Chardin. He was an evolutionary palaeontologist and geologist, involved with the discovery of ‘Peking Man,’ and even the famous half-man/half-ape fossil skull called ‘Piltdown Man,’ which remained undetected as a forgery for 40 years. Such is the faith in evolutionary paradigm. De Chardin was praised by the recent popes, Benedict XVI in 2009 and Francis in 2015. He promoted pagan mystical ideas including that evolution unfolded from cell to organism to planet to solar system and ultimately to the whole Universe. This is exactly the pagan Gaia hypothesis. It also shows how accepting of pagan ideas the Church of Rome is, especially Jesuit teaching. “Some claim that evolution is just a theory, as if it were merely an opinion. The theory of evolution — like the theory of gravity — is a scientific fact. Evolution really happened. Accepting our kinship with all life on Earth is not only solid science. In my view, it’s also a soaring spiritual experience.”12 (emphasis added). To claim that biological evolution is on the same footing as the experimentally tested theory of gravitation is an old worn-out trick. Evolution, meaning molecules-to-man, is not experimentally testable at all. What repeatable experiment could you do to show that process occurring in the lab? Well, usually, equivocation is used. “We observe change; just extrapolate that long enough and you can get anything!” But it is disingenuous, because it depends critically on the details of the imagined change. Most mutations destroy information but to get from simple molecules to man, via the way of the zoo, requires that a stupendous amount of new genetic information must be added. Where does that come from? I don’t find it difficult to believe at all that scientists, whether they profess to be atheists, or cosmic humanists, or priests of some persuasion, if they reject the plain reading of the Holy Scriptures on the origin of the Universe, would accept or even promote pagan beliefs. The Universe made itself, or, arose spontaneously from a quantum fluctuation, or, from a primeval atom, is about all that they have left to choose from. It is either God-centred Bible-honouring or it is pagan with the creation creating itself. Lemaître’s expanding big bang universe is no different. It is purely a religious pagan concept; it’s not science. Ironically Lemaître is a French name meaning “the master”. I say ironically because any Dr Who fan out there would recognise the Master as a Time Lord like the Doctor who is his arch-nemesis. Time Lords could only have any relevance in a post-Einstein General Relativity era, as in the fictional stories they manipulate both space and time. Georges Lemaître, Un univers homogène de masse constante et de rayon croissant, rendant compte de la vitesse radiale des nébuleuses extra-galactiques, Annales de la Société scientifique de Bruxelles, Sèrie A, 47, 49, 1927; translated into English in MNRAS, 91, 483, 1931. G. Lemaître, L’Hypothèse de l’Atome Primitif: Essai de cosmogonie (The Primeval Atom Hypothesis), Neuchâtel, Griffon, 1946. Gary Haitel, Origins and Grand Finale: How the Bible and Science relate to the Origin of Everything, Abuses of Political Authority and End Times Predictions, p.11, iUniverse, Bloomington, IN, 2014. David L. Block, A Hubble Eclipse: Lemaître and Censorship, arXiv.org preprint, 2011. John Farrell, The Original Big Bang man, The Tablet, The International Catholic Weekly News, March 22, 2008. Tania Marie’s Blog (a pagan). 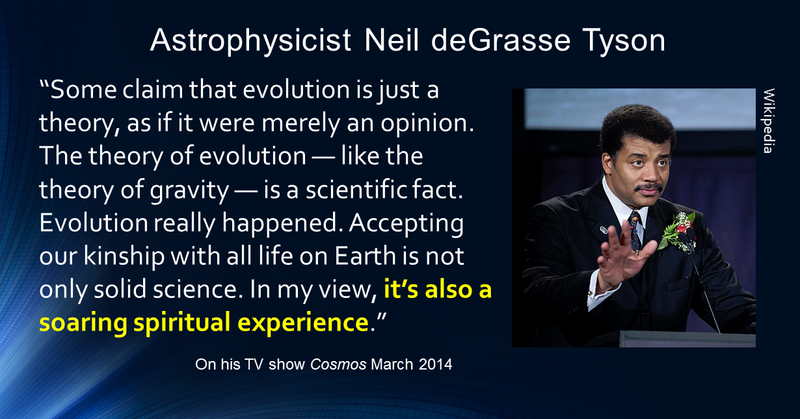 Neil deGrasse Tyson on his March 2014 TV show Cosmos: A Spacetime Odyssey. Carl McColman, The Complete Idiot’s Guide to Paganism, Alpha Books, Penguin Group, 2002. I’ve heard of some new studies by scientists from University College London and Imperial College London led by Daniela Saadeh and Stephen Feeney that allegedly prove the cosmologic principle is true, contrary to what you’ve been saying all the time. What are your thoughts on this? I have also heard about a new Solar System allegedly forming around TW Hydrae, observed by Takashi Tsukagoshi using the ALMA telescope in Chile. The evidence was published by Astrophysical Journal Letters. Is this the one you’ve been talking about in your previous post? What exactly do you think of this? Regards and God bless! In regards to the claim that “Daniela Saadeh and Stephen Feeney that allegedly prove the cosmologic[al] principle is true” I have not read their work yet. But let me a make a few points. Firstly no physicist especially a cosmologist or astrophysicist should ever use the concept of ‘proof’ or use the word ‘prove’ because in physics we cannot prove anything only disprove an hypothesis. This is even more so in cosmology where it is not even repeatable operational science. I have said this many times before. See Cosmology is not Science! and Big bang fudge factors. So in relation to their simulations of what a universe should look like, given certain conditions, it is clear that they rely on certain initial unprovable assumptions about the state of the universe. Researchers found that the size of the dust particles in the inner 22 au gap is smaller than in the other bright regions and guess that a planet similar to Neptune is located in this gap. They actually see no planet. But I would not argue against the existence of a planet anyway. But the question is: Is it a planet forming under naturalistic forces now? That is the question. See Planetary system formation: Exposing naturalistic storytelling and A protoplanetary system in formation? which discusses a planetary disk in the HL Tauri system.